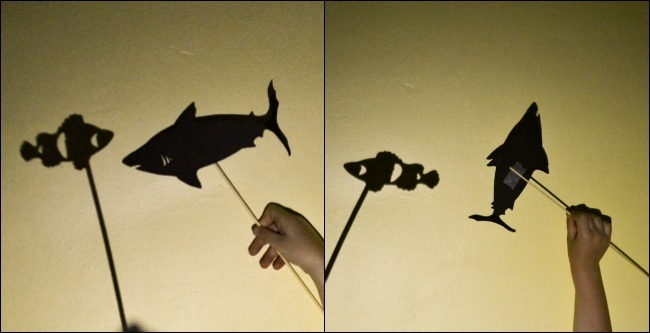 Study marine life and the science of light and shadows with kids, using these sea-themed shadow puppets! 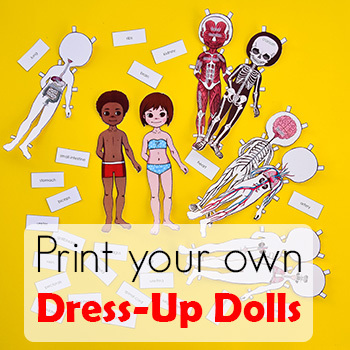 You can cut them yourself or buy a set. 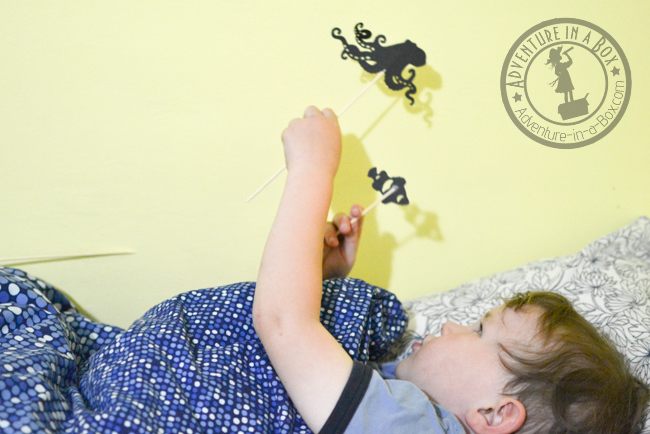 Two years ago, I wrote about our first shadow puppet performance at home. Back then, our son was just watching them, but as he has grown, he has naturally turned into an actor and a director. It has become a special part of his night time routine. It doesn’t happen daily – sometimes we have several evenings worth of shadow play in a row, and other times we go for weeks without one. But whenever shadow friends appear in Budster’s bedroom, it’s an exciting and happy time. My son’s favourite shadow puppet sets are The Three Little Pigs where he usually chooses the role of the wolf and Goldilocks and the Three Bears where he performs as Goldilocks. After we go through the plot, he often wants to have a few additional scenes where the wolf and pigs are dancing together or the Bear family goes on a picnic. As his stories have branched off further and further from the originals, I have came up with more shadow puppet characters that aren’t based on fairy-tales. 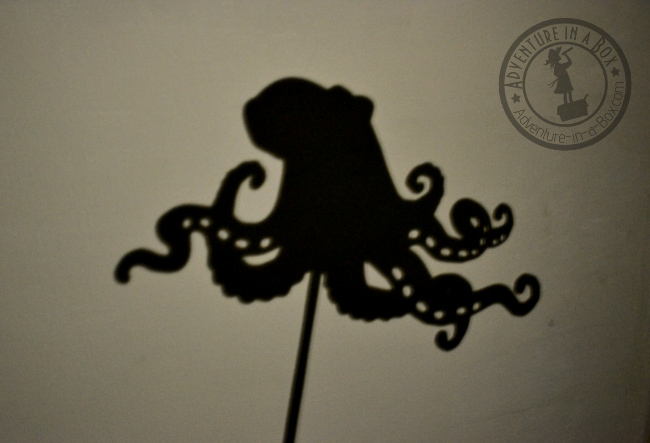 The ocean life shadow puppet set sprang from Budster’s fascination with the underwater world. 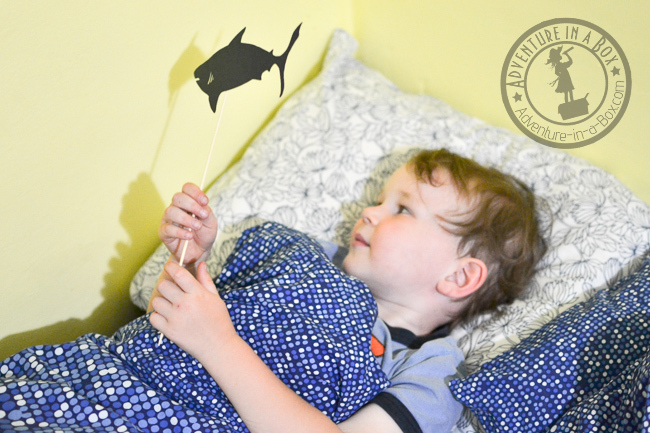 I knew he’d love to see a shark shadow lurking around the walls of his bedroom while little fish are hiding in the blue of his bed, and he sure did! And since he’s been interested in marine life since he was a toddler, it’s not a surprise that he’s seen and liked the movie Finding Nemo. Actually, he has probably watched it ten times, though I still haven’t dared to show him the very beginning where Nemo’s mother and all his siblings get eaten by a shark. 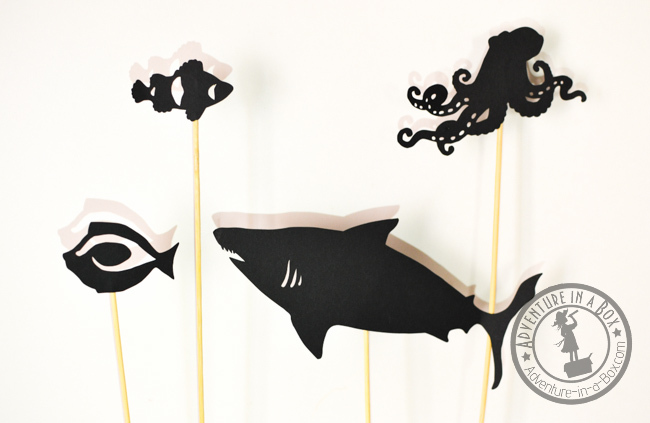 I started making the ocean life shadow puppet set a while back. Then I found out that Finding Dory is coming to the theatres this summer and got excited. It seemed like a good time to finish my craft before delving into new aquatic adventures. And while our shadow puppet set is based on real animals, it isn’t a simple coincidence that you can see all of them in the Finding Nemo and Finding Dory movies. If Budster wants to make his own stories about the little clownfish and his friends, he certainly can! 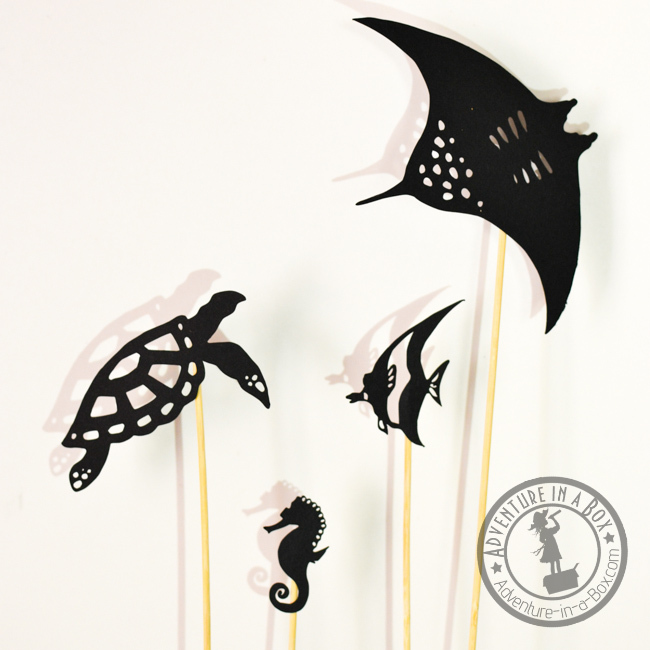 In the ocean life shadow puppet set, there are silhouettes of a clownfish, a blue tang, a Moorish idol, a great white shark, an octopus, a sea turtle, an eagle ray, a seahorse, and a star fish. Buy the puppets already cut here! 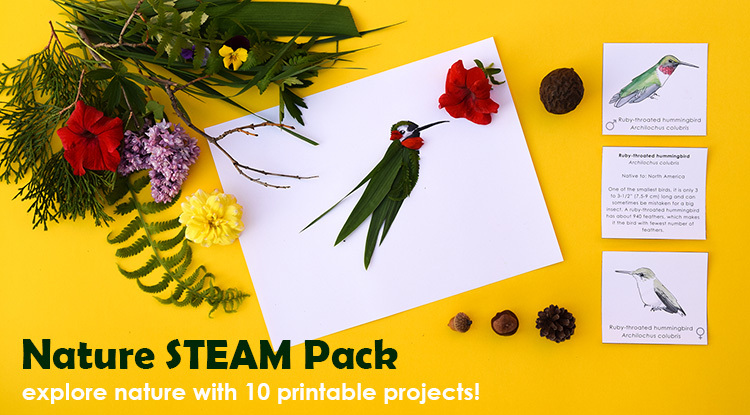 Explore nature with 10 printable STEAM projects for chiildren! 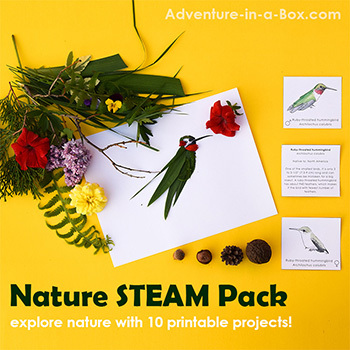 They will learn about nature while playing games, completing engineering challenges, going on scavenger hunts, and making art with natural materials. 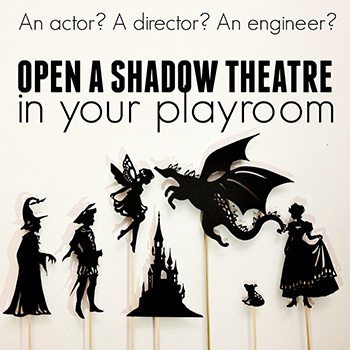 Two years ago, I wrote about how we stage shadow puppet shows with our homemade theatre. We still do it on occasion, but most often we use nothing more than a flashlight. Then we cast shadows right on the walls and the ceiling. It’s quite relaxing to lay by my little boy in his bedroom and watch the shadows move around. Dad joins us too, with squeaky voices for little fellows and growls for big ones! 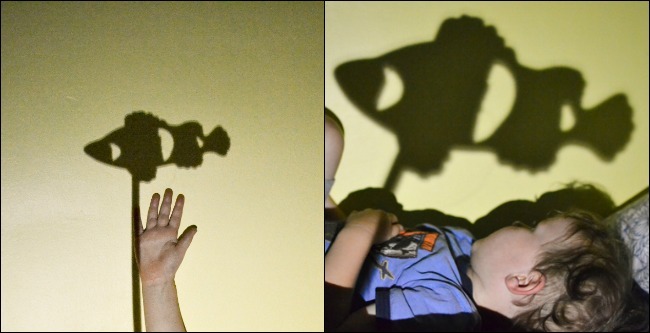 Yesterday, we tried the ocean shadow puppet set for the first time. My son made a little story, and we had a few games. First of all, Budster was determined to include the world map on the wall into his story. 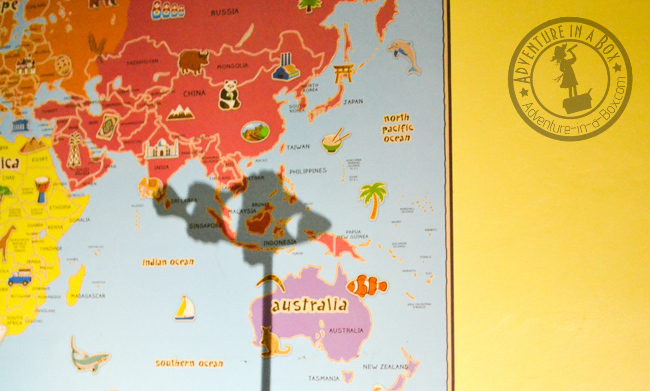 The shadow characters travelled around and had adventures in different parts of the world. The shadow clown fish went to visit its relative in Australia, and the shark had a trip around all four of the oceans. The map worked with animal shadow puppets very well, and I can see us using them together more when Budster gets interested in geography. Another aspect of shadow play that I find fascinating is experimenting with light. If we hold the puppet further from the flashlight, it casts a crisp but small silhouette. Closer to the flashlight, and the shadow is big but somewhat blurred. Simple enough, but the trick doesn’t get old. Dangerous business – playing tag with a shark! I had a shadow puppet of a fish, and Budster was chasing it with the shark. There were lots of giggles, albeit not from the fish. With silent shadows gliding around the room, it’s usually a very quiet and peaceful time of heavy eyelids and falling asleep… But not when my ever energetic son is concerned. 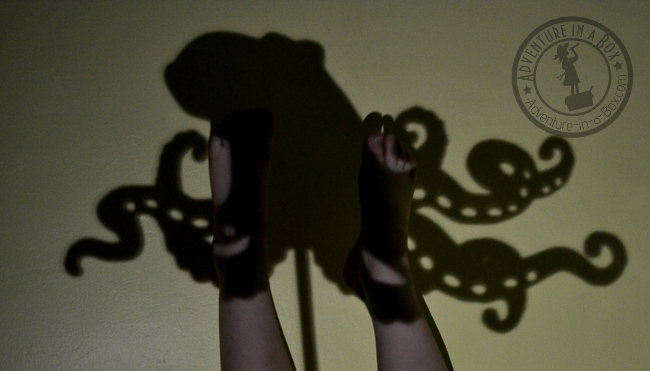 Instead, he managed to include a bit of a work-out in the end, sticking his legs up against the octopus’ eight shadow tentacles. Budster announced that he was comparing them together. He has a way to go if he is an aspiring octopod! We love shadow puppets. They’re good for retelling stories from books and they’re even better for making our own rambling tales. 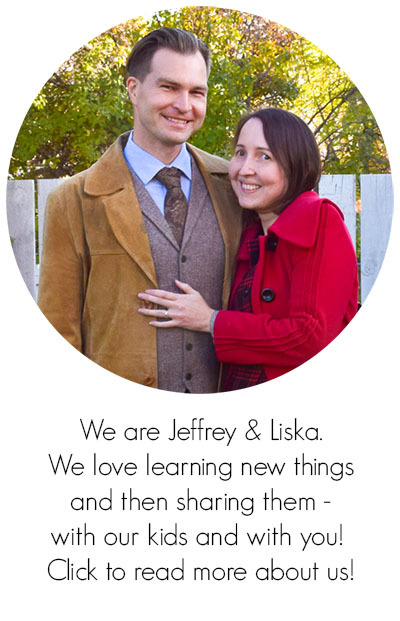 I hope you share our pleasant experience! 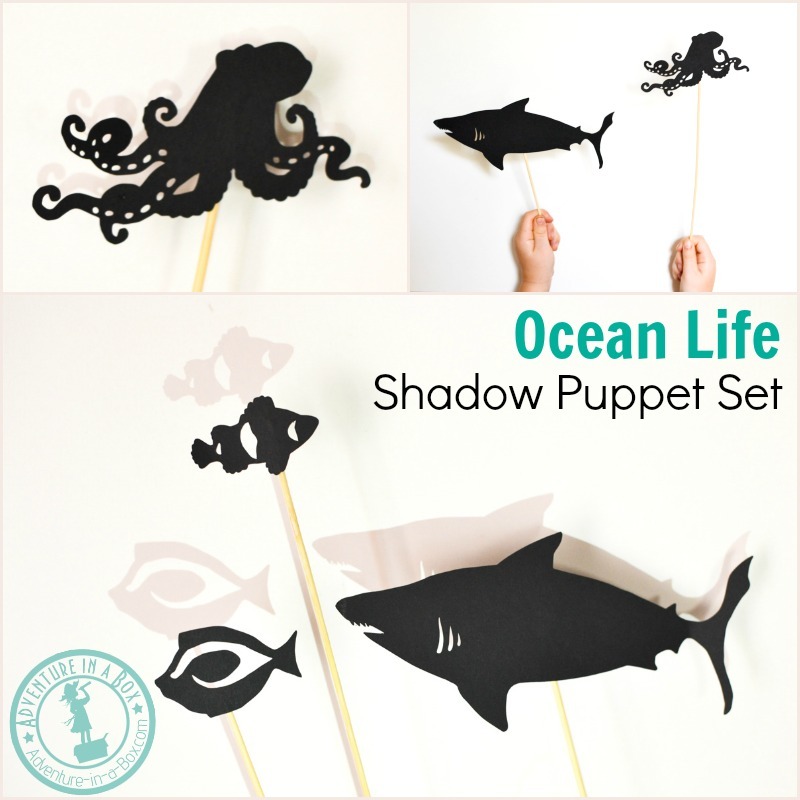 You can buy the ocean life shadow puppet set cut from our store or download the template and cut it yourself! If you want to stay updated with new stories from Adventure in a Box, consider subscribing to our Facebook, Pinterest or Instagram pages.